Raïm – Visca Havana! Visca Catalunya! If you like rum you’ll love this place. And, if you enjoy mojitos you’ll love this place. You’ll find RAÏM amid the warren of narrow streets and lovely squares that comprise the barrio of Gràcia. A former bodega, established in 1886, with huge barrels, an antique wood-panelled fridge and marble counter, is now an animated expression of the profound connections between Cuba and Catalonia. More than 20 plus brands and vintages of rum are available. When you step into the bar you’ll smell the mint they use for mashing mojitos. Photographs from pre- and post-revolution Cuba demand closer inspection while you knock back a seven-year-old oscuro. 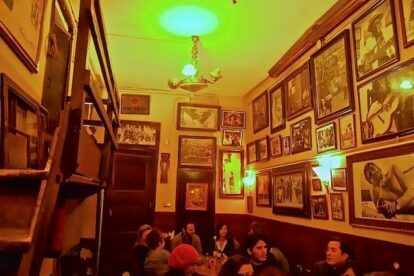 Amid the portraits of musos, you’ll find a large photo of a recumbent, half-naked Che, like a rock star, sipping on yerba mate. Gets rammed with a friendly clientele on Friday and Saturday nights. And it’s easy to see why, lots of atmosphere and probably the best value mojitos in Barcelona. Offline Barcelona tips? Get our iPhone / Android app!